That was the response of Governor Lieutenant-General Sir William Dobbie to the island being awarded a George Cross by King George VI for a “heroism and devotion that will long be famous”. The award was announced via a letter from the King on 15 April 1942. Fast forward 77 years and a Maltese man is single-handedly showing that same heroism and devotion by standing up for what he knows is right in God’s eyes. Matthew Grech found fame as a contestant on Malta’s X Factor but he has faced a tidal wave of criticism, even at a governmental level, for saying on the show that the love of Jesus Christ has compelled him to leave a homosexual lifestyle. He also insists – and this is what really riles his critics – that at no point did he have conversion therapy. It was a free choice out of obedience to God. Matthew said he changed when he read the Bible and realised homosexuality is not about feelings or orientation. 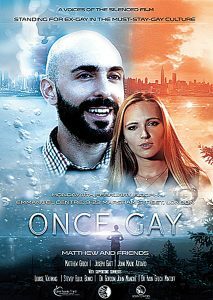 LGBT groups protested outside the screening of a film about Matthew’s life, called ‘Once Gay’, which was shown in the Townsend Presbyterian Church in Belfast in February. The film can be seen online via www.voicesofthesilenced.com.